Last Saturday I popped down to the Hope for Syria fundraiser, which was held not to far from me. The first stall that I came across was Hijabi Threads. I had been meaning to purchase a few of their hijabs from their Facebook page as I love the prints and they have reasonable pricing (+free p&p), but unfortuantely never got around to it. The first one to catch my eye was the Miss Ethnic Mix hijab and I didn't hesistate to buy it. I am gutted that I didn't pick up the Black Paisley maxi hijab (or the taupe version) though and will definitely be purchasing this in the future. The Miss Ethnic Mix hijab is a blend of different patterns, from polka dots to paisleys, and the main colours are neutral (beige and black) but with hints of blue and orange, making it a very versatile scarf as it can be worn with a number of outfit colour combinations. 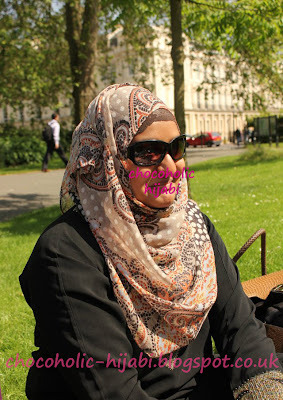 I wore this hijab paired with a simple black abaya to a blogger meetup (we had a lovely picnic!). The weather was pretty hot that day, and this hijab was a great choice as it is very lightweight and thin, making sure that I didn't get overheated throughout the day. It was also easy to style (I added folds into my hijab style for the first time, and they didn't slip/fall out) and the lightweight fabric made it easy to drape.